In the first quarter of 2018, MobyMax conducted a large-scale experimental study with 4,000 students in 230 classrooms across the United States. The dramatic results that qualify as ESSA Tier 1 “Strong Evidence” conclusively demonstrate the benefit that comes from finding and fixing learning gaps with MobyMax. The study showed that MobyMax had an effect size of 0.875 for language, and 0.702 for math. This is roughly 40 weeks (more than one school year) of additional growth. Finding and fixing missing skills is a powerful intervention for all students with learning gaps. Students with higher learning deficiencies benefited significantly from MobyMax. In fact, the gain by students with a high learning deficiency exceeded the difference between the experimental and control group! Is a well-designed and well-implemented randomized control experimental study. The study employed a randomized control trial design. In addition, the study met the What Works Clearinghouse (WWC) evidence standards without reservations. Shows a statistically significant positive effect on improving student outcomes. 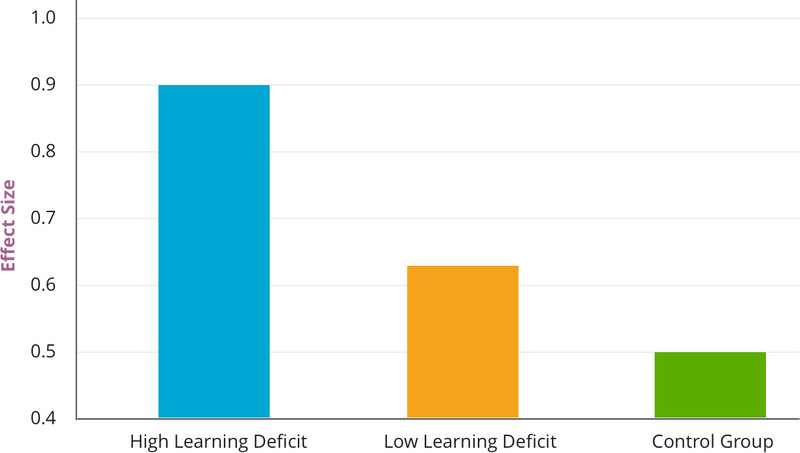 The study showed that MobyMax has a statistically significant positive effect on improving student outcomes with an effect size of 0.875 for language and 0.702 for math. This is roughly 40 weeks (more than one school year) of additional growth. Has a large, multisite sample. The study was based on a representative sample of K-8 schools across the United States that includes over 4,000 students in 230 classrooms. A large sample, as defined by ESSA, is a sample of 350 or more students, or 50 or more classrooms.